HERE Technologies mission is ‘creating a digital representation of reality’. How that works now and may work in the future thanks to the use of Car Sensors and the H2020 project Automat is described here. Road Roughness is an indication of the quality of a road. A standardized measure for road roughness is the International Roughness Index (IRI), which is introduced in 1996. The HERE Road Roughness Product is a content layer that can be displayed on top of maps, indicating the respective road roughness at specific road segments (see below). Quality is ranging from best quality of an airstrip to cobblestones represented on a scale from Poor (Cobblestone, potholes) to Fair and even Good. Use cases where the knowledge on road roughness is needed are road maintenance and planning (e.g. by public authorities), logistics and transportation (e.g. to avoid rough roads for fragile transports). 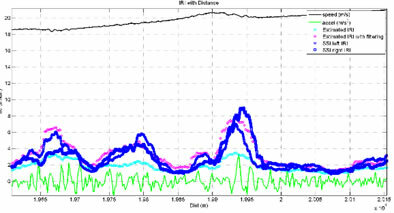 The novelty of sensors may create an opportunity to collect Road Roughness using sensor readings from production cars. Cars with an Automatic Suspension System can detect and adapt to rough roads and if the sensors used to detect the roughness is made available in the cloud a map can be created when the location is known. Apart from Active Suspension Systems maybe also other sensors can be used to give an indication of Road Roughness. When the amount of data from Sensors is growing, that will allow us to update a Road Roughness map even on a monthly basis where current maps are generated once a year. When the freshness of the map improves maintenance of deteriorated roads can be improved and prioritized. Cars will also benefit having the ability to adjust their suspension system prior to driving a road or part of the road classified as ‘Poor’. By delivering information from car damper sensors on road roughness and potholes, public authorities will know quicker where next road maintenance is needed. This data will enable an efficient work organization as well as prediction and better planning of maintenance actions. This will result in lower costs, more safety on the road and a happier driving experience. In the Automat innovation project, we use both data science and established methods to determine Road Roughness(e.g. using cars accelerometers). The readings from the sensors from production cars are compared with information we derive from determining Ground truth. Automat is a H2020 innovation project where car sensor data of multiple OEM’s can be used by the community using a Marketplace. The marketplace explores ways to generate money for people and companies that provide data and bring both suppliers of data and innovative providers together. One of this innovative services can be Road Roughness. What we want to achieve with the principles of Automat for Road Roughness is to increase the freshness of Road Roughness indications and extend the coverage of roads with a Road Roughness classification. Instead of collecting data from cars that drive all roads once a year, using standard car sensor data of thousands or even millions of cars to generate more often and a more accurate map while covering more roads than we currently map for Road Roughness at comparable costs and/or lower Carbon footprint.